Golf, Shopping, and Beach! Waterway Village at River Oaks with WIFI! Waterway Village at River Oaks Golf Plantation.A Gated Community Just minutes from beaches, shopping, airports and restaurants! Broadway on the Beach, NASCAR Cafe and Hard Rock Cafe less then five miles! My condo is on River Oaks Golf Plantation Fox Course 1st hole. The unit is fully stocked kitchen, vaulted ceiling, upper end unit overlooking the first green at the Fox Course. There is an indoor and outdoor pool with a hot tub. Fishing Pier on the intercoastal waterway with a boat dock, plus a lake with Gazebo walkway! Two bedroom, two bathroom with full-size pullout sofa, sleeps six. Dishwasher, washer, dryer, TV in both bedrooms and Flat Screen Smart TV & DVD player in the great room. Plus a screened in Porch! My wife & I live in the Mountains of North Carolina. We bought this condo when our kids were young. Being on the golf course and not far from the ocean seemed and still is perfect for us. 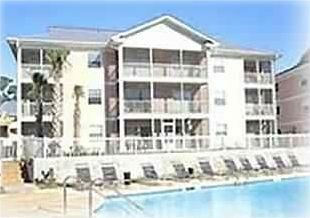 This condo is centrally located in Myrtle Beach right off US 501 and on the Inter-Coastal Waterway. Only a couple of Mins. from Broadway on the Beach for Restaurants and shopping and a couple of miles from the beach. I have my management Co. On-site so you will not need to drive around to pick-up or drop off keys. If something needs attention they will jump right on it 7 days a week! Gated Community, Fishing Pier on Inter-Coastal Waterway, Onsite registration. Just off US 501 at theInter-Coastal Waterway!